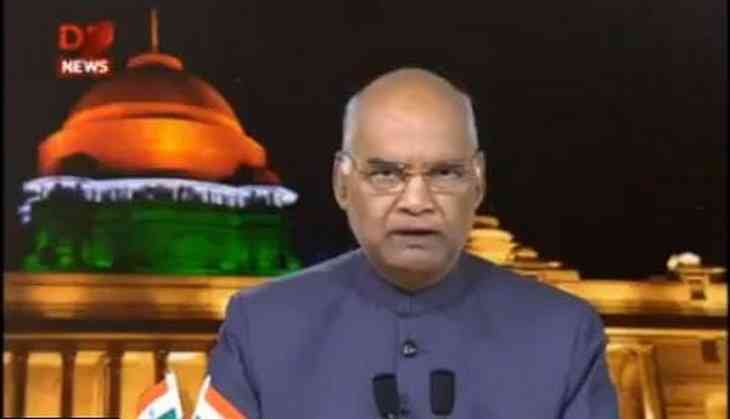 President Ram Nath Kovind on Thursday addressed the Joint Sitting of both Houses of Parliament ahead of the Budget Session and said that the implementation of Goods and Services Tax (GST) has reduced the difficulties faced by traders and at the same time enhanced their ease of doing business across the country. "While Sardar Patel with his extraordinary abilities had accomplished the challenging objective of geographic and political integration of the nation, the task of economic integration remained incomplete. Our traders and entrepreneurs always faced difficulties in sale and purchase of their goods and in complying with different tax regimes prevalent in different states," President Kovind said. "Now with the implementation of a comprehensive tax reform like the GST, the concept of 'One Nation-One Tax-One Market' has been realised. GST is proving instrumental in establishing an honest and transparent system of trade and commerce which is also benefitting the country's youth. This system, while reducing the difficulties faced by traders, has enhanced their ease of doing business across the country," he added. The President later congratulated the country for "wholeheartedly embracing the new system in a short span of time in the interest of a better future for the country, in spite of the initial bottlenecks." "My government is continuously improving the GST regime keeping in view the suggestions being received from the business community," he said.